When San Francisco authors Michelle Gagnon and Mark Coggins appeared at the Velma Teague Library on their recent book tour, they both had Phoenix connections. 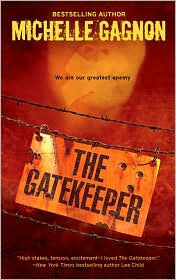 Mark grew up in Phoenix, while Michelle's latest book, The Gatekeeper, has a great deal of action there. To begin the program, Michelle talked about the background of her book, using a PowerPoint presentation. The Gatekeeper is the third book featuring FBI special agent Kelly Jones. Gagnon said she had some help because she has a friend who has been in the FBI for over thirty years. In the '90s, he worked tracking domestic terrorism. But, after 9/11, all forces were switched to monitoring foreign immigrants on our soil. Since then, hate groups in the U.S., what domestic terrorists have become, have doubled in size. Those hate groups use the Internet to rally people to their cause. The biggest fear of Gagnon's FBI friend isn't another 9/11 on our soil. It's a fear of another Oklahoma City. That's the background for Gagnon's book. The Gatekeeper starts at the Arizona State Capitol in Phoenix, with the murder of U.S. Senator Duke Morris. Different parts of him are found on a statue. Initially, the FBI thinks he was murdered because of his stand on border issues. A great deal of the story revolves around border issues, so the settings include Phoenix, other parts of Arizona, and Texas. It's a complex issue, and Gagnon includes people with different stances about it. There are some very different settings in The Gatekeeper, moving from the border areas to rusting ships off San Francisco. This is ripe for environmental disaster. Michelle showed a picture of ships in a daisy chain formation, set close together. The boats are lined up perfectly for a scene in the book. Jake Kelly, Kelly Jones' off-and-on-again lover, is involved with a kidnapping case. It's the kidnapping of a sixteen-year-old girl, the daughter of a physicist at Livermore Labs. He's the person in charge of the consolidation of radioactive waste. Lots of wast disappears in this country. One picture showed 1-10 in Phoenix, with the caption, "Avoid 1-10." Phoenix plays a major role in the story. Three quarters of the way through, the storyline goes back to Phoenix. Bad things happen to the city in the book. Another scene that is important to the story is a clustered housing development, close to the U.S./Mexico border in San Diego. There was also a photo labeled, "Scary Stuff," the entrance to Yucca Mountain Repository. In theory, the repository should survive a disaster. All high level nuclear waste will go there, and they have excellent security. However, low level storage disposal has almost no monitoring. According to Gagnon, one example of the type of disaster caused by this lack of monitoring is the accident in Goiânia, Brazil in 1987, when scavengers found a source of cobalt, a camera, in an old hospital. The cobalt was a pretty blue color, and before the disaster was over, one man planned to make a ring of it for his wife, and a little girl ate some of it. People died, and hundreds more were exposed. That was due to just a low level of nuclear waste. Most such old cameras are lost or stolen. But, Gagnon said someone trying to transport the nuclear waste for a dirty bomb in a suitcase wouldn't get very far. They would die of exposure unless it was in a lead container. Michelle Gagnon ended her talk with information about hate groups. She showed a map of the United States, showing 17 of them in Arizona. California has 80, while Alaska and Rhode Island have none. But, maybe the most surprising photo was this one of two girls. They make up the pop band, Prussian Blue, and, with their blond hair and blue eyes, they recorded for the white supremacist label Resistance Records. Gagnon commented dryly that they are a good argument against homeschooling. Michelle's FBI friend said that, fortunately, most groups are a lot of talk, and no action. In the '90s, one KKK group almost blew up a natural gas plant in Texas, but a member reconsidered and reported the plot. He fears that someone organizational skills will bring groups together. Lately there have been billboards, and even an add in school papers to draw attention to their causes. He fears there would then be another Oklahoma City. When asked about her research, Michelle said she researched for about a year, and consulted experts, from her friend in the FBI to bomb experts, to a CIA agent. When Michelle turned the program over to Mark Coggins, his first photo was the illustration from the cover of his book, The Big Wake-Up. The artist is Owen Smith. He's done New Yorker and Rolling Stone covers. But, it was the posters of characters from The Maltese Falcon that really caught Coggins' eye. The illustration is of two characters from the book, opening a coffin. They are August Riordan, the private investigator, and his sidekick, Chris Duckworth. Coggins went on to tell the story of María Eva Duarte de Perón, who we know as Evita. She was born in rural Argentina, and married Juan Perón when he was a rising politician. As First Lady of Argentina, she was very popular for her work for social reforms for the poor and women. But, she died an early death at thirty-three of cancer. Eva hard a large funeral, and she was mourned by the poor people of the country. Juan Perón planned a gigantic monument, and planned to put the body on display in it, similar to how Lenin is preserved and on display. Perón wanted the body specially preserved, so he hired Dr. Ara as embalmer. Dr. Ara spent a year and a half preserving the body, and it was said that she looked better dead than she had alive. The body glowed. 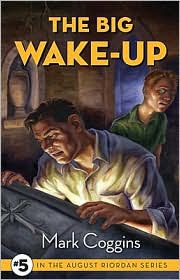 That's the illustration on the cover of The Big Wake-Up, Riordan and Duckworth opening the coffin of Eva Perón. That's why there is a glowing light coming from the coffin. Before he could finish the monument, Juan Perón was deposed, then kicked out of Argentina, but he couldn't take the body with him. It was left in Argentina, but the new government didn't want the body as a rallying point for the people. On the other hand, they were afraid of backlash if they dumped the body. So, they moved it around, and had duplicates of the body made, and moved them around as well. For a time, the body was hidden in a man's attic, and he became enamoured of it. His wife became suspicious, and went up in the attic. He was afraid it was the military, and shot and killed her. The body was even stored in a movie theater, and when they were moving it by truck, there was an accident, the truck caught on fire, but the coffin bounced out of the back, and was unharmed. So, the story went around that there was a curse on the body. Eventually, the body was taken out of the country, and buried in Italy, under a fake name. Peronists kidnapped the military President, and demanded to be told where the body was. When that didn't work, they killed him, and held his body for ransom. Eventually, the Argentinian military had the body dug up, and gave it back to Perón, where he was in exile in Madrid. Perón had Dr. Ara work on the body again. For a while, it was kept in his living room, in an open coffin. In 1961, Perón married an exotic dancer named Isabel. Perón encouraged her to get in the coffin with the body, hoping some of Eva's power would rub off on her. When the military dictatorship failed in Argentina in the early '70s, he was re-elected. He died after six months, and Isabel became President, maybe because of Eva's power. Once Isabel became President, she brought Eva's body back to lie in state with Perón. But, Anti-Peronists dug him up, and cut off his arms, because when he spoke his arms were outstretched. Evita is supposedly buried in a crypt, three stories underground. All of the above is the truth. Coggins said he used that for the conceit of his novel, in which a fake body was sent to Buenos Aires. The real body is buried somewhere in the Bay area, under a fake name. August Riordan is asked to find the body by a relative, but he doesn't know he's actually looking for Evita's body. There are three groups of people competing to get the body back. One group, the current government, hires a woman named Isis to recover it. She's an expert in Egyptian mummification techniques, and she has her own reasons to want the body. She's sort of creepy. The old ex-military group wants the body to destroy it. And, there is a group of Argentinians who want to restore the body. Riordan is caught between the three groups. Coggins said he usually includes pictures in his books, so the pictures he showed of cemetery statuary was very appropriate for this book. Author Tomas Eloy Martinez, in his book, Santa Evita, calls her, "Evita...the Sleeping Beauty of Latin America." Putting that quote together with Raymond Chandler's The Big Sleep, Coggins called his novel, The Big Wake-Up. When Mark ended his presentation, the audience asked questions, beginning with one directed to Michelle Gagnon. "How do you get a hold of experts to answer your questions?" She said it gets easier with each book, since you're an established author, and the experts realize a book is actually on its way to publication, so they help. She's also met experts at Bouchercon, and other conferences. Former law officers attend, and will help. Mark mentioned Dr. Doug Lyle, who will answer any questions about forensics. Michelle said there are a group of scientists who work with the Defense Dept., so for The Gatekeeper, she called Stanford University, and asked for advice. Experts are readily available, and she's never had a problem with research. But, she said, you don't want to be on a bomb guy's email list, because they'll send you scary stuff. She finally asked to be taken off the email list for one expert. But, she needed lots of experts for this book She had a friend who did two stints in Afghanistan. He put her in touch with someone in Special Forces. Mark and Michelle said they both use the same ATF guy. Michelle also recommend Sisters in Crime. She said they often have experts come to their meetings. At one, she met an FBI guy who had been on of three on site for the arrest of the Unabomber. They were asked if they're more locked into their characters, writing a series. Coggins quoted Barbara Peters from Poisoned Pen as saying there should be five books in a series, and then no more. Mark said his character is at a resting point at the end of The Big Wake-Up, the fifth in the August Riordan series, and he might not be back. But, he said, bestselling authors can often try other things, and their publishers are fine with it. Dennis Lehane took a hiatus of ten years from his series after writing five books, and now he's ready to do another one. Michelle said she's finishing her fourth one, and she's done with her characters for now. She may take a more minor character and build a story around them. They mentioned Lee Child, who has written thirteen books about the same iconic character, Jack Reacher. But, Reacher is a drifter, who can go anywhere, with just his toothbrush and the shirt on his back. He may have aged a little, but his abilities haven't changed. John Sandford, on the other hand, has shown his character, Lucas Davenport, aging. Michelle said she likes the developing ARC. She did say a series gives an author more opportunity to go into depth and develop the character, and she likes that. They were asked, if you're under contract for a book, how much say do you have as to what you write. The answer was, once you reach a certain level, your publisher will buy anything you want to sell, but that's at the NY Times level, like Lee Child. If he said I'd like to write about Frances L. Neagley this time around, he could sell it, because they'd buy anything from him. Michelle said she only has two or three books under contract at a time. And, Mark said once authors get successful, they often feel an obligation to keep the series going. He knows a successful author who would like to write a different series, but doesn't feel as if she has the energy to do both the successful series, and the one she'd like to do. The program concluded with a question about their plans, since Mark said that might be the end of the Riordan series. He said he has no firm plans, but he might work with a minor character from one of the books. Michelle answered that she has to finish the next book, tentatively titled Racing the Devil, and it should come out in November 2010. Let's hope Mark Coggins and Michelle Gagnon both continue writing crime novels, no matter in what direction their writing takes them. The Big Wake-Up by Mark Coggins. Big Earth Publishing, ©2009. ISBN 9781606480557 (hardcover), 271p. Thanks for hosting us--we had a great time! Interesting books! I've enjoyed reading more about their process. Sounds like a great event. Thanks for a great summation! I wish I could have been there, but now I feel like I was :) I am truly intrigued by both stories. They just might have to find their way to my Christmas stocking. They sound like great reading for some days off at the holidays! Thanks for posting. As usual, you give us the best!! You're welcome, Mark! Thanks for coming. I'm glad you both enjoyed it. It was fun. It was a fun event, Elizabeth. Wish you could have been there! What a nice comment, Inside a Book! I try to give you a good recap, so those who weren't there can find out about it, and, as you said, maybe be interested enough to pick up one of the books! Thanks for having us, Lesa, it was a lot of fun! You're welcome, Michelle. Any time! Thanks for coming to the library.